This course is designed for teachers and trainee teachers preparing for the Cambridge ESOL TKT: Content and Language Integrated Learning test (TKT: CLIL). It is ideal for both content and language teachers. Written by a CLIL expert in collaboration with Cambridge ESOL, this course covers the four key areas of the test: knowledge of CLIL and principles of CLIL, lesson preparation, lesson delivery and assessment. It will also be useful for anyone seeking an introduction to CLIL theory and practice. The TKT Course CLIL Module introduces teachers to the concepts and terminology central to CLIL and provides an introduction to its main theories, approaches and activities. Teachers are then encouraged to apply these to their own teaching contexts and analyse their usefulness to their own learners. Materials and activities are available which further develop and explore the topics introduced in the course. 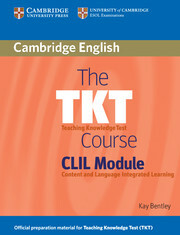 Written by a TKT CLIL expert in collaboration with Cambridge ESOL. CLIL terms and concepts are clearly explained for non-specialist teachers. Model practice test and TKT: CLIL sample tasks help candidates become familiar with the format and style of the TKT exam. Regular concept checking tasks and full answer key make it perfect for self-study. Methodology section with practice test in one volume provides a comprehensive package for TKT CLIL candidates.